When Abraham Bredius died in 1946 at the age of ninety, he bequeathed his vast collection of more than 200 paintings to the municipality of The Hague. 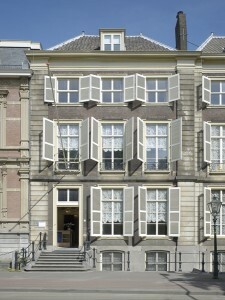 At his departure to Monaco in 1924 he had turned his large house at Prinsengracht 6 in The Hague into a museum. Until 1985 his collection of paintings, drawings, antique furniture, silverware, cristal and china had been on view for everyone. When the museum was closed the collection went into depot, but in 1990, on the initiative of a number of The Hague art lovers and with the support of sponsors, Museum Bredius opened its doors again, this time at Lange Vijverberg 14. At present the restorationprogramme is almost finished, so that the largest and the best part of the collection of paintings can be shown to the public in all its colour and lustre with which it adorned the walls of the first owners three and four centuries ago. Bredius’ furniture and applied art were also returned to the museum, so that the domestic atmosphere of the place was retained. * On presentation of valid student card. The Hofvijver passe-partout leads you through the heart of The Hague; het Hofvijvergebied (the court pond area). This is the place where The Hague originated; once a dunelake with the castle of the Dutch Count, now the centre of power in The Netherlands. A special walk will take you along important historic places and sights around the Hofvijver and invite you to visit several unique musea. For € 16,00 you can visit Museum de Gevangenpoort (Prison Gate), Galery Prins Willem V, Museum Bredius, the Haags Historisch Museum and the visitors’ centre under the Ridderzaal (manorial hall). Museum Bredius is situated in historic premises. Corridors, staircases and thresholds are narrow and the floors are uneven. Unfortunately the museum is not accessible for wheel-chair bound visitors. Museum Bredius is accessible on foot from The Hague Central station, or by taking the tram or bus. From The Hague HS station the Museum Bredius is accessible by tram. Refer to via 9292.nl.for current travel directions using public transport. By car, take the A4 (Amsterdam – Delft), the A12 (Arnhem/Utrecht – Den Haag) or the N44 (Nieuw Vennep – Den Haag). Follow the directions for Centrum. Check www.routenet.nl for custom travel directions. Parking is possible at the newly opened Parking Museumkwartier.